would continue to work with them to move the country forward. interest forms to recontest the presidency in 2015.
world, he was only an individual that on his own, could do nothing. to the next level,'' the president said. country was over, adding that, “Nigeria is a great country''. handled the Ebola case with the whole world being happy with Nigeria. deck to move the country to the desired level in the years to come. not let the people down. him the right of first refusal. me and for giving me the right of first refusal. would have had,'' the president said. candidate for the 2015 presidential election. by coming to pick the forms himself. performed creditably well, to re-contest their position in 2015. According to him, the governors will be given the right of first refusal. 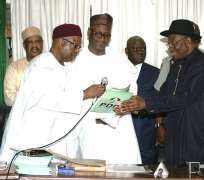 The post Jonathan Picks Nomination Form, Promises To Work With Nigerians appeared first on Pointblank News .